During the holiday season, I serve up quite a bit of eggnog. It’s a wonderful treat for family and friends because it is not only delicious, but it’s also only available around the holidays, so it really makes a gathering festive. I make homemade eggnogs and buy eggnog, as well. As the holidays wind down, I sometimes have some extra ‘nog on my hands and turn it into other treats, such as Eggnog Belgian Waffles and this Eggnog Coffee Cake. 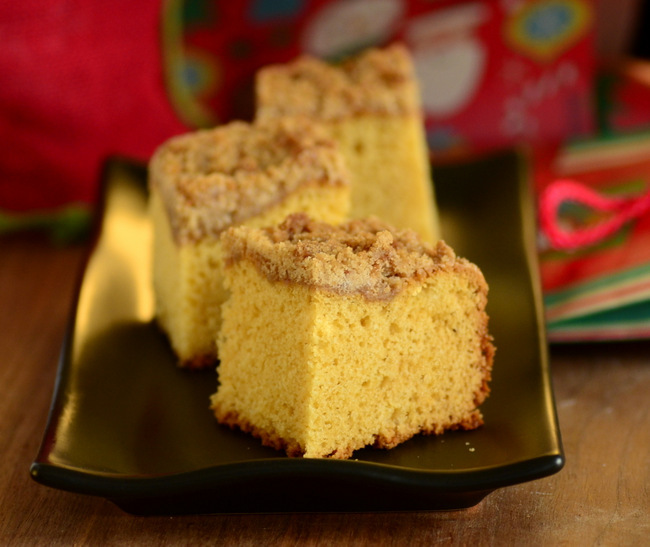 This coffee cake recipe has a tender cake that is bursting with holiday flavor because it is made with a generous amount of eggnog. It is also flavored with additional vanilla and nutmeg, both common seasonings for fresh ‘nog. I used a prepared eggnog in this recipe and would recommend that you do the same. A homemade eggnog can be used, but prepared eggnogs (the kind you can buy at the store) work very well and are even easier to use. There will be some variation from brand-to-brand when it comes to how thick your eggnog is or exactly how sweet it is, but those variations won’t through off this recipe. A buttery cinnamon and nutmeg streusel sits atop the cake, adding a nice amount of texture and sweetness to every bite. I like the traditional look of the streusel on top of the coffee cake, but you can actually give the batter a quick swirl to pull some of it down into the cake, which gives you a bit less crunch and a little extra sweetness. This recipe is designed to bake in a 9-inch square baking pan. It bakes up to be a tall cake with a generous layer of streusel, so this is not a good recipe to try to scale down to an 8-inch pan. If you don’t have a 9-inch pan, opt for a larger one rather than a smaller one for best results. The cake is ready to eat as soon as it has cooled to room temperature, though I have been known to sneak a piece while it is still warm. The cake will remain fresh for a couple of days after baking if it is stored in an airtight container. I typically serve this up in very large pieces, but if you’re going to pair it with other brunch items, you’ll easily get 12-16 smaller pieces out of a batch. In a large bowl, cream together butter and sugar until light and fluffy. Blend in eggs one at a time, followed by vanilla and nutmeg. Stir 1/3 of the flour mixture into the butter mixture, followed by the eggnog. Stir in an additional 1/3 of the flour mixture, followed by the milk. Stir in remaining dry ingredients and mix until no streaks of flour are visible. Pour into prepared pan. Set aside while you prepare the streusel. Make the streusel: In a large bowl, whisk together flour, sugar, brown sugar, salt, ground cinnamon and nutmeg. Add in butter and, using a fork or a mixer on low speed, stir until the mixture has the consistency of wet sand. Grab the streusel mixture in your hands and squeeze to create clumps of streusel. Sprinkle streusel mixture evenly over the top of the cake batter.